Download Kung Fu Panda in Digital HD from the iTunes store. 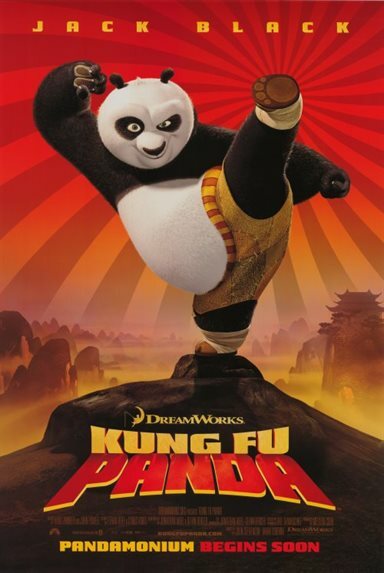 Kung Fu Panda images are © DreamWorks Animation. All Rights Reserved. With its lush visuals and eye-popping fight scenes, "Kung Fu Panda" may be one of the best looking action film ever produced. "Animation isn't a genre. It's a type of film-making that can be used to tell any type of story." And what the folks at PDI / DreamWorks Animation evidently decided to do is use CG to create a truly visually stunning chopsocky picture. And given that "Kung Fu Panda" 's characters continually talk about the importance of history, honor and tradition ... Well, it's entirely appropriate that this John Stevenson / Mark Osborne movie honors the history of all those animated features that came before it by opening with a traditionally animated sequence. You heard right. I said "traditional animated." The artists at James Baxter Animation delivered a beautifully stylized opening for this film. Where Po -- a pudgy panda -- dreams that he is a Kung Fu master. A legendary warrior like the Furious Five, that quintet of martial arts virtuosos charged with protecting the Valley of Peace. In reality, Po works in his father's noodle shop. And when he's not accidentally serving the customers deadly throwing stars along with their breakfast soup, this panda dreams of someday visiting the Jade Palace and learning the ways of Kung Fu. Well, as it turns out, Po is about to get his wish. For Oogway -- the thousand-year-old turtle who actually invented that mystical martial art -- has had a vision. He believes that Tai Lung, a former student who had to be locked away because of his lust for power, is about to break out of Chorh-Gom Prison. Which is why Oogway decided that it's now time to select the Dragon Warrior. So Oogway summons Shifu, the master of the Jade Palace, and then tells him to assemble his finest Kung Fu students. And as the local townspeople look on, the wise old turtle bypasses acknowledged champions like Viper, Mantis, Tigress, Monkey and Crane in favor of ... Po. Shifu protests, insisting that it was just an accident that this pudgy panda was chosen to become Dragon Warrior. But as Oogway points out, "there are no accidents." Okay, I know. The above plot description makes "Kung Fu Panda" sounds overly serious and mystical. It's really not. Stevenson & Osborne -- working off of Jonathan Aibel & Glenn Berger's clever screenplay -- get the balance just right. So though the needs of the film's story are always being serviced, the plot always being pushed forward, there are still lots of character-driven laughs for the audience to discover along the way. But -- to be honest -- what I think what you'll come away from "Kung Fu Panda" remembering most aren't the laughs. But -- rather -- the action set pieces. Tai Lung's escape from Chorh-Gom Prison. That snow leopard's battle with the Furious Five at the rope bridge. Shifu using food to motivate Po at the Pool of Sacred Tears. Tai Lung's battle with Shifu at the Jade Palace. Or -- for that matter -- the film's finale. Where the snow leopard and the panda fight to see who will ultimately possess the secret of the Dragon scroll. These sequences are so well staged, so wittily choreographed ... Well, they're just dazzling. Mind you, to offset "Kung Fu Panda" 's breathless action sequences, there are some quiet & achingly beautiful moments in this movie too. Like when Oogway says goodbye to Shifu at the Peach Tree of Heavenly Wisdom and then transcends to the next plane of existence by becoming a flurry of cherry blossoms. Is "Kung Fu Panda" perfect ? Sadly, no. This movie's fortune cookie of a message (i.e. Always believe in yourself, for you are your own secret ingredient) kind of gets lost in the filmmakers' third act run-for-the-curtain. But that relatively minor mis-step is more than offset by KFP's great vocal cast. Which includes Jack Black as Po, Dustin Hoffman as Shifu and Ian McShane as Tai Lung. Now factor in "Kung Fu Panda" 's short running time (Just 91 minutes long, versus "Speed Racer" 's 135 minutes and "The Chronicles of Narnia: Prince Caspian" 's 140 minutes) ... And you're in for a fast paced, fast moving family night out at the movies. So if you just can't wait 'til "WALL-E" for your feature animation fix, then you should definitely consider checking out PDI / DreamWorks Animation's latest. For "Kung Fu Panda" is one fun summer flick. Kung Fu Panda images © DreamWorks Animation. All Rights Reserved.